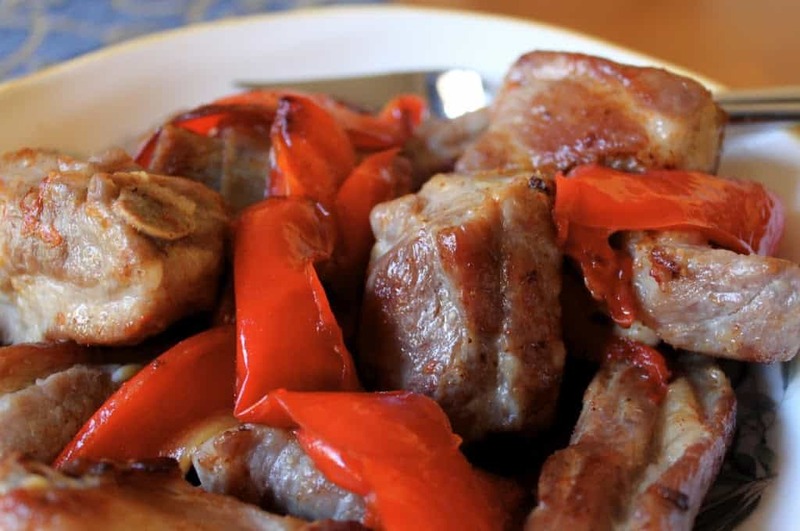 Pork and pickled peppers with potatoes is a typical Italian dish from the region where my mother was born. If you love pickles, you’ll flip for this dish. It’s hard for me not to mention Peter Piper when talking about pickled peppers, but truly, he has no business here. Pickled peppers are no joking matter. Seriously, how many of you have actually eaten pickled peppers? 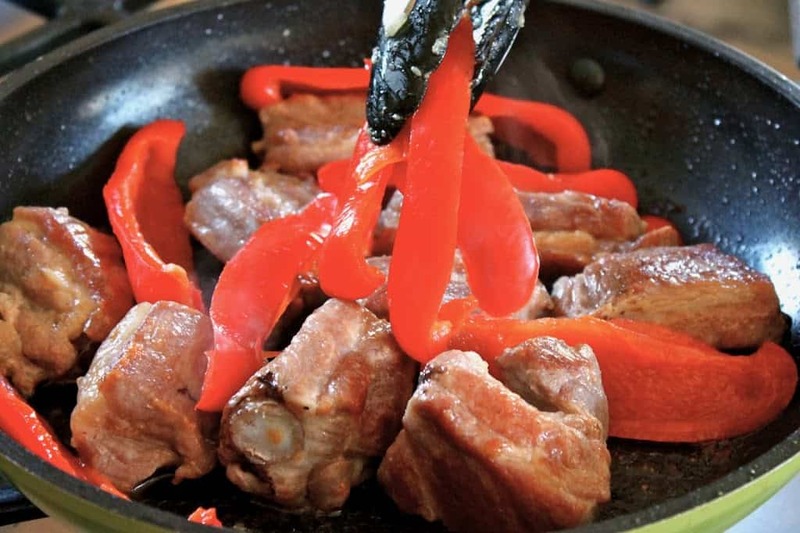 Since I’m a vinegar and pickle “fiend,” these mouth-watering, red beauties are one of my favorite things to eat, especially when prepared with pork. They entice me as much as the best, dark chocolate! 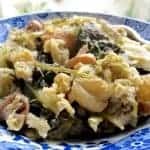 This is a meal that my mother and her family ate when she was growing up in Italy. However, it was usually made only once a year, when the pigs were slaughtered to make prosciutto, sausages, and pancetta. 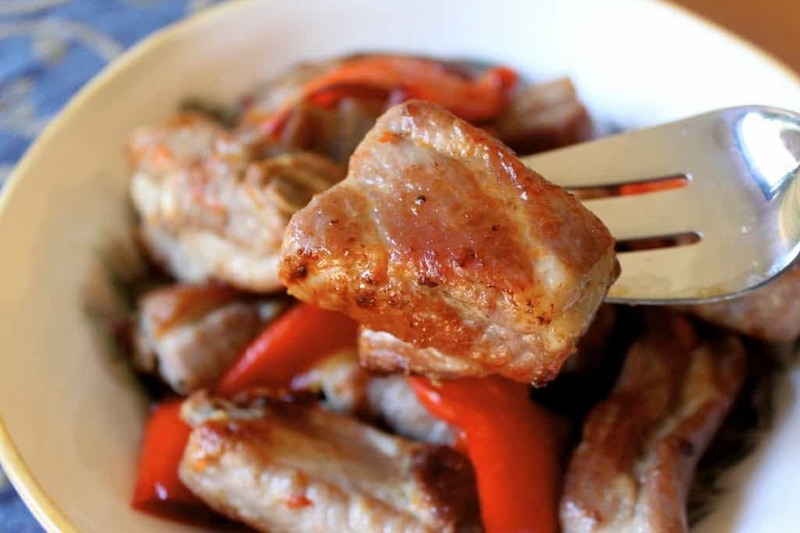 The tips of the ribs were typically prepared with pickled peppers. 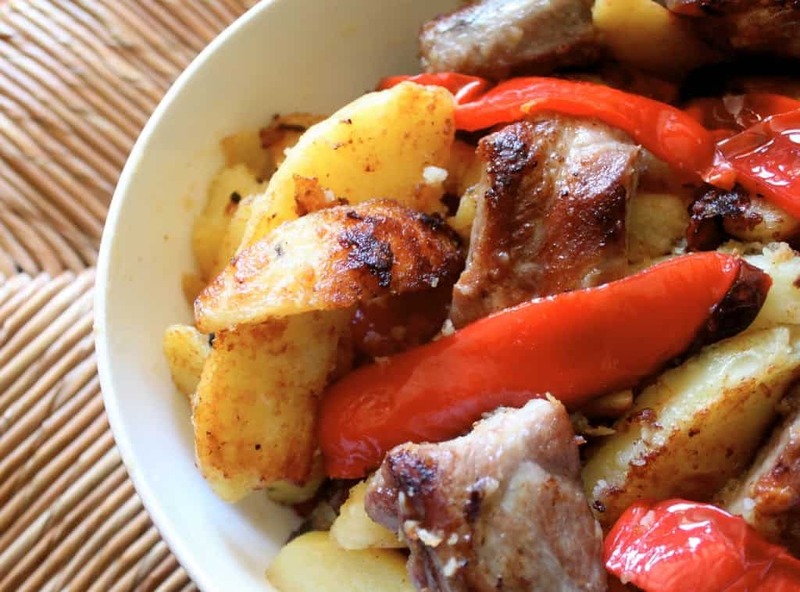 Now, when we make this, we also add potatoes because we love them and they go really well with the pork and peppers. You can ask for pork brisket bones from your butcher or the meat department of your local grocery store. 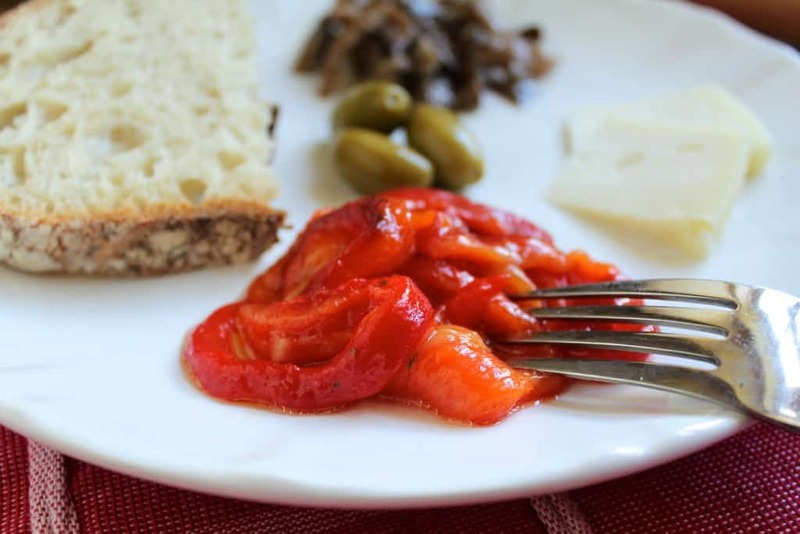 If you love sweet red peppers, try this recipe, too! I’m going to show you how to make the original dish (including how to pickle peppers) and at what point to add the potatoes, if you so choose. *although I’m not Jewish, I LOVE to Kosher meats when cooking as it really brings out the flavor, especially with pork (I know, the irony.) PLEASE NOTE: I am not Jewish and do not claim that my method is the correct way to Kosher meat. This is how I “kosher”: soak the meat in water for 30 minutes, drain and place on a cookie rack over the sink, preferably at an angle so the meat can drain after being salted. Then using KOSHER salt, (no other salt will do-honest!) sprinkle it generously on all sides of the meat and let it drain. How long you ask? That’s where you will learn with practice because it depends on how thick the meat is. 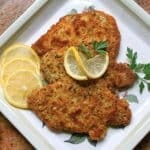 I would advise starting out with 15 to 20 minutes with small pieces of meat, or chicken, then after you’ve made the dish, if you decide it needed more salt, leave it longer the next time. To Kosher a large roast would probably require an hour or so, but until you get some practice, err on the side of a shorter time, as you can always add salt later, but you can’t take it out. 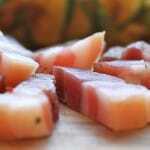 Koshering turns the meat a lovely pink color and amps up the flavor like you won’t believe. It’s worth the trouble, truly. Do not add any more salt to the meat when cooking. 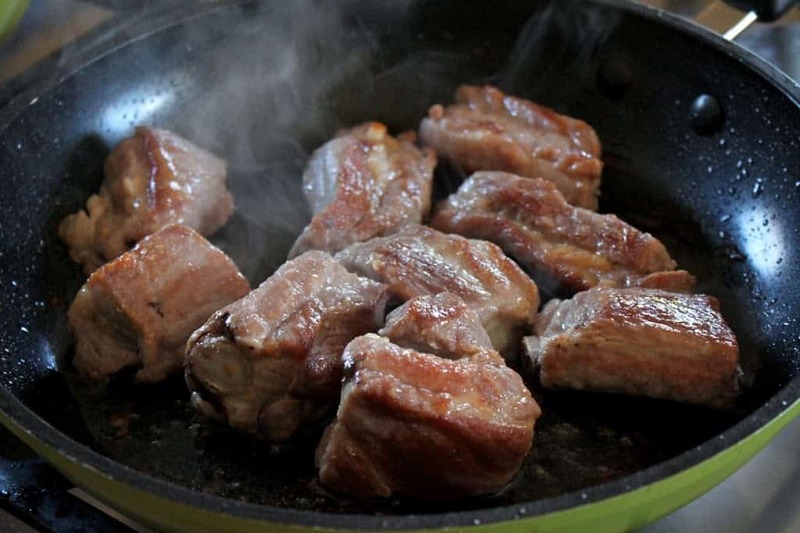 Place 2 or 3 tablespoons of olive oil in a saute pan over medium high heat, and add the pork pieces. 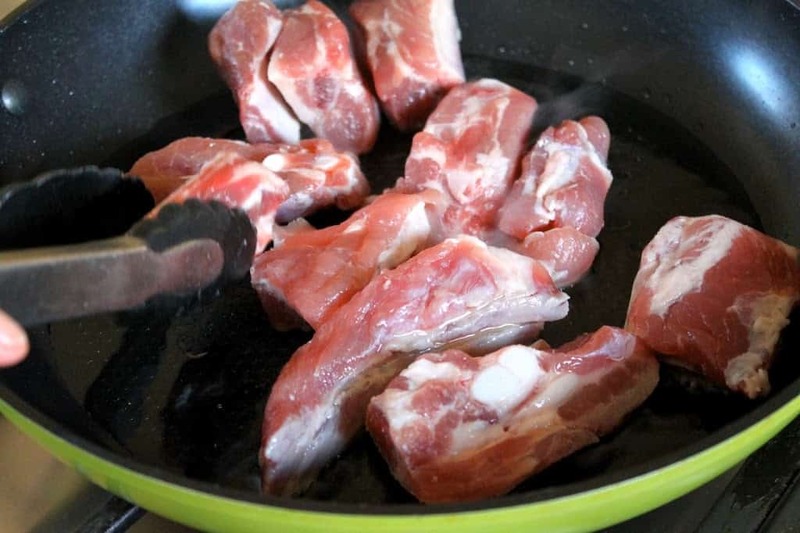 Once pork is seared on one side, turn the pieces, then place the cover on the pan for about 15 minutes. The pork will soon start to brown and caramelize nicely. 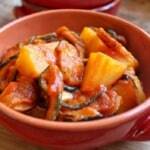 At this time, add the pickled peppers, as they do not need to cook for too long. After about 8 minutes or so, remove from heat and serve immediately. Because I Koshered the pork, the flavor is fabulous! No spices needed! Here is the finished dish, when made with potatoes. 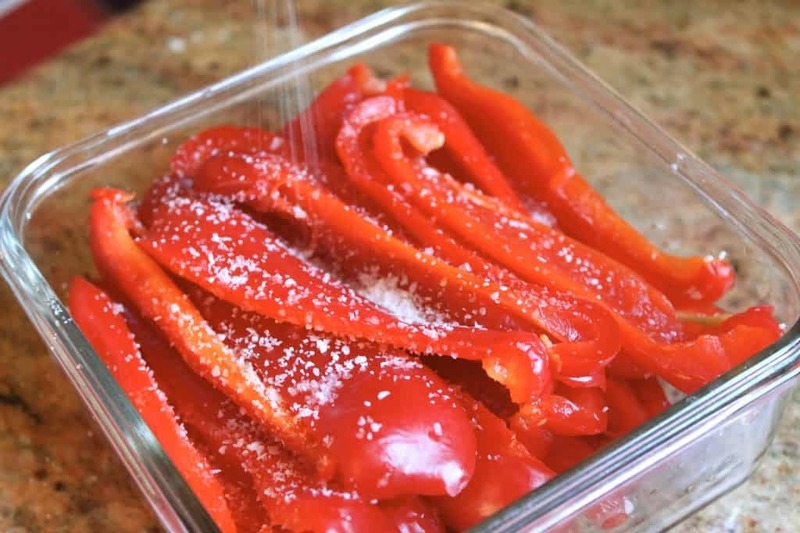 Place pepper strips in a bowl or container and sprinkle generously with Kosher salt. Set aside for 4 to 6 hours or overnight, then rinse and drain well. Heat the vinegar in a pot over medium high heat until it comes to a boil, then add the peppers. 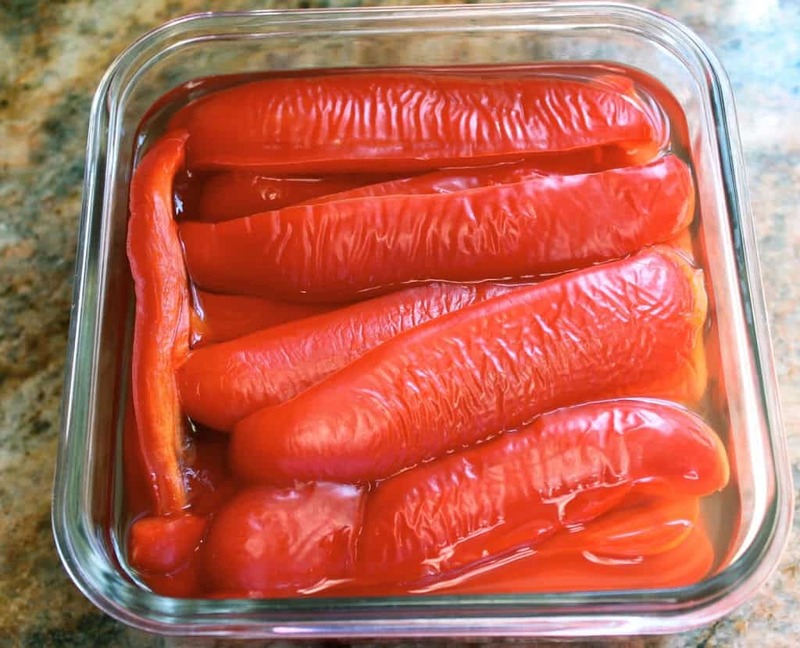 Keep peppers under the vinegar mixture for about 2 minutes, then remove from heat and allow to cool. 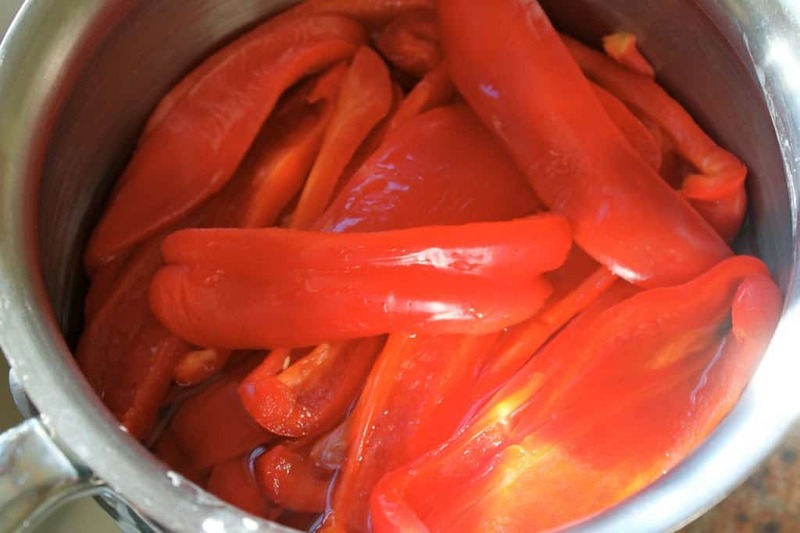 Place peppers and vinegar in a jar or glass container and store in the fridge until ready to use. These will keep in the fridge for 3 to 4 weeks. 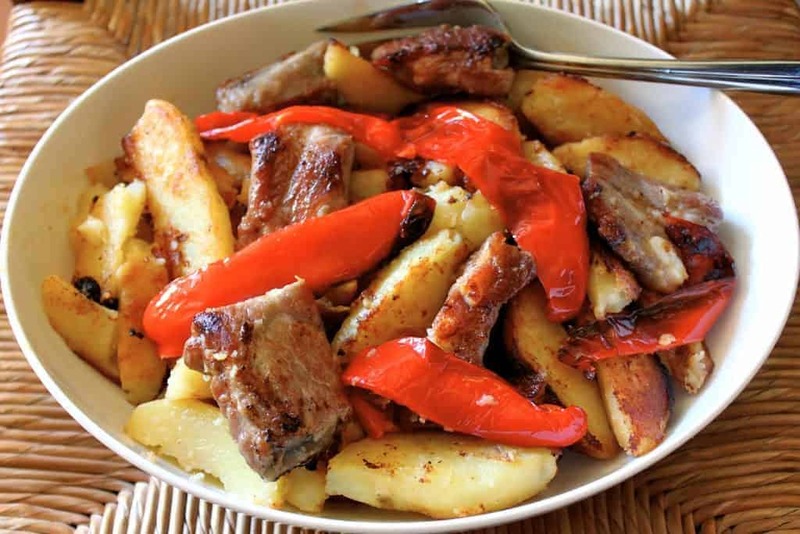 A simple, Italian pork and pickled pepper dish which you can add potatoes to, if you wish. 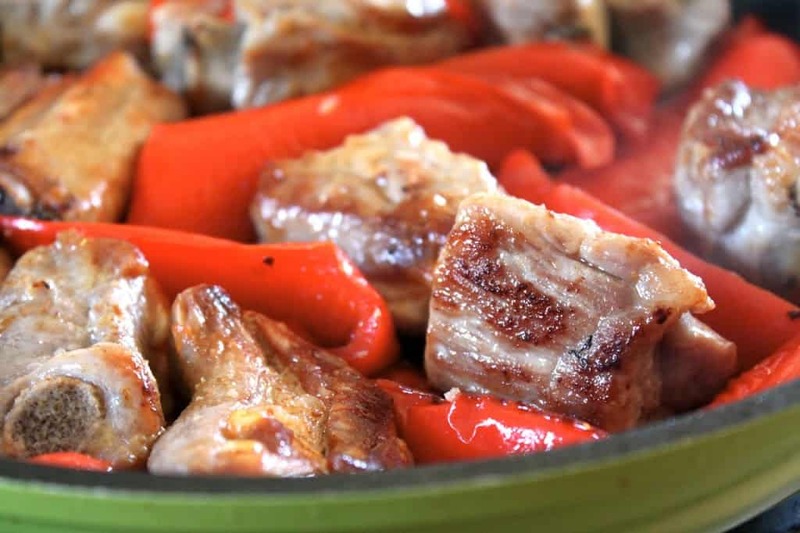 Place 2 or 3 tablespoons of olive oil in a saute pan over medium high heat, and add the pork pieces. If you koshered the meat, do not add any more salt. 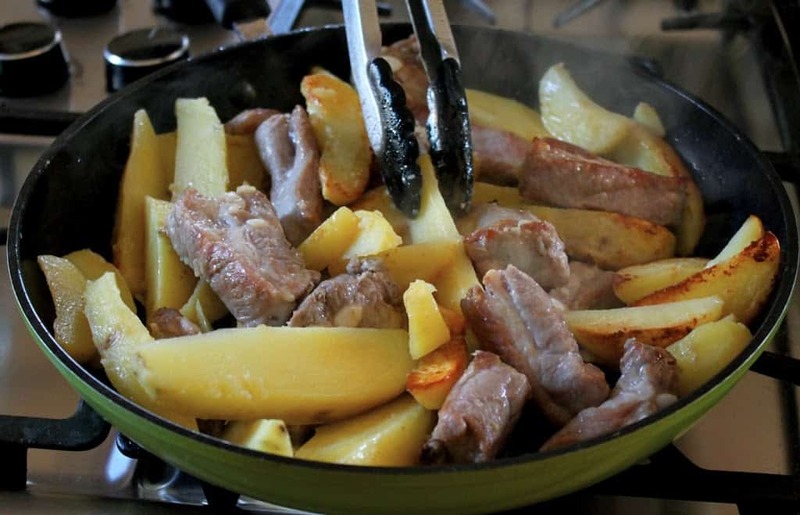 Remove the lid, and continue to cook the pork (adding potatoes if using-you can remove the pork and cook the potatoes until almost ready (add some salt) then add the pork back in and continue cooking the pork and potatoes. Set aside for 4 to 6 hours or overnight, then rinse and drain well. Heat the vinegar in a pot over medium high heat until it comes to a boil, then add the peppers. *although I'm not Jewish, I LOVE to Kosher meats when cooking as it really brings out the flavor, especially with pork (I know, the irony.) PLEASE NOTE: I am not Jewish and do not claim that my method is the correct way to Kosher meat. This is how I "kosher": soak the meat in water for 30 minutes, drain and place on a cookie rack over the sink, preferably at an angle so the meat can drain after being salted. Then using KOSHER salt, (no other salt will do-honest!) sprinkle it generously on all sides of the meat and let it drain. How long you ask? That's where you will learn with practice because it depends on how thick the meat is. 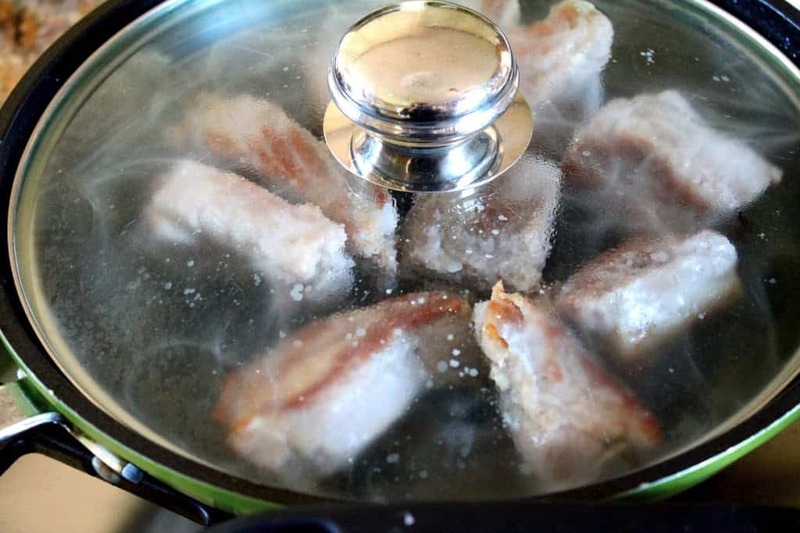 I would advise starting out with 15 to 20 minutes with small pieces of meat, or chicken, then after you've made the dish, if you decide it needed more salt, leave it longer the next time. To Kosher a large roast would probably require an hour or so, but until you get some practice, err on the side of a shorter time, as you can always add salt later, but you can't take it out. Koshering turns the meat a lovely pink color and amps up the flavor like you won't believe. It's worth the trouble, truly. When I read the recipe I had to laugh at ‘Kosher pork”. It really is a good method. 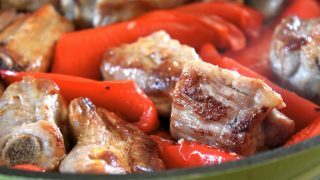 This sounds wonderful, I LOVE pickled peppers and eat them with so many different dishes on sandwiches or in salads, it love the pork and potatoes and peppers. My Mother used to make something very similar and I loved it, I don’t think it had potatoes but think thats a brilliant addition.